Westerners brought beer to the Vietnamese, who, besides learning to enjoying a frosty glass of it on a sultry day, discovered that its yeasty flavors were great for cooking seafood. I use Rolling Rock but any light dry lager will do. In Vietnam this dish is made with fresh heads-on prawns but here regular shrimp stands in beautifully. I buy mine mostly frozen these days because they thaw quickly and you can control the freshness. Serves 4 when served with other dishes. If shrimp shells are not already cut through back and deveined, slice into backs and remove veins, leaving shells on. Rinse shrimp and pat dry. Toss into a medium bowl with scallions, ginger, garlic, lemongrass, salt and pepper. Chill 1 hour. Heat beer in large saucepan until simmering. 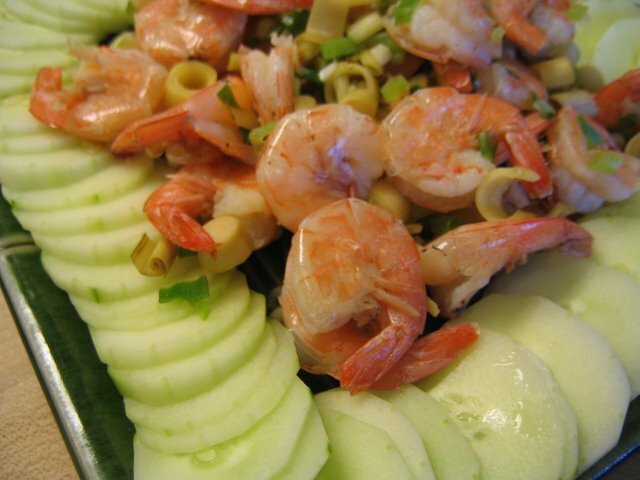 Add marinated shrimp. Cover saucepan, lower heat, and steam 5 minutes, until shrimp is pink and cooked through. Strain and place on a platter with optional cucumber garnish (which is also good in the dipping sauce). Eat by peeling shrimp and leaving shells and chopped flavorings behind on platter. Mince together garlic and hot pepper and mix well with sugar (you could also use a mortar and pestle). Add fish sauce, lime juice and water and stir well until sugar dissolves. 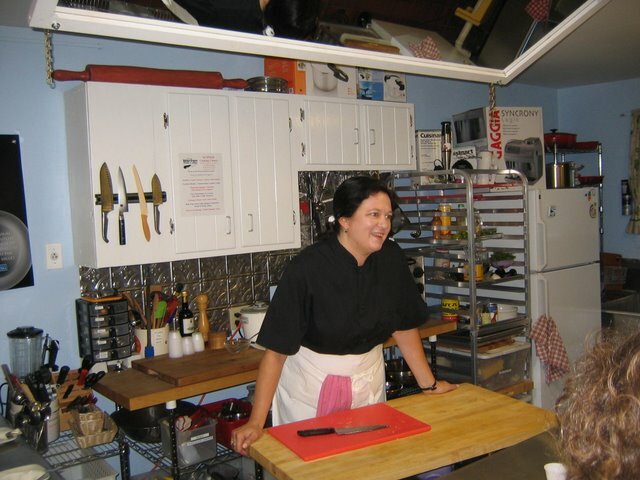 Adjust to taste and let sit a few minutes before serving. 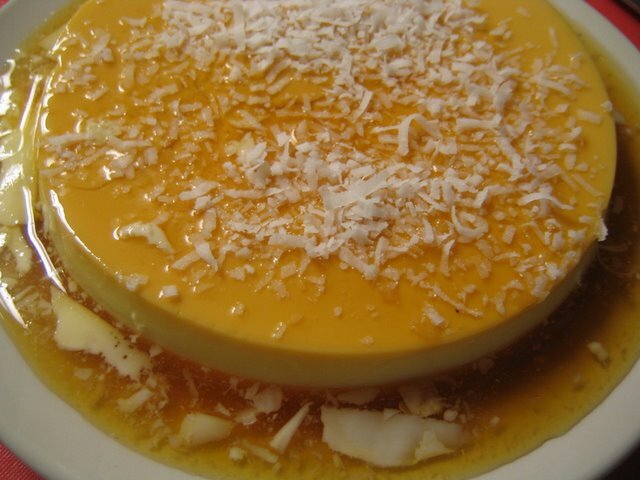 That coconut flan looks to-die-for. Thanks for posting! This silky, not-too-sweet treat is similar to Spanish and Mexican flans and related to French crème caramel and crème brulee. One of my top favorite desserts, I adore it for its unique texture and contrast of sweet and slightly bitter. Make a day ahead for best flavor. Serves 6. Preheat oven to 300˚ F. Set aside a 1½ quart soufflé dish. To form the caramel topping, heat a small heavy saucepan over low heat. Add 1/3 cup of the sugar and stir occasionally. After a few minutes it will begin to get gooey and then form lumps. Watch carefully to keep from burning, watch for the lumps to dissolve and the sugar to turn to brown syrup (this may take 10-15 minutes). Then add water carefully—it will sputter and bubble up—and stir rapidly until the sugar is liquid again, about 2 minutes. Remove from heat and immediately pour into 1½ quart soufflé dish. Tilt to coat bottom and let cool. In a medium saucepan, heat coconut milk, milk and remaining 1/3 cup sugar over low heat, stirring, until sugar dissolves, about 10 minutes. Let cool. In a medium mixing bowl place eggs with vanilla and salt. Whisk well until thoroughly blended, add to coconut milk mixture and mix together well. Pour through a sieve into a bowl and then into caramel-coated soufflé dish. Place soufflé dish into a larger pan such as a roasting pan lined with a couple of layers of paper towels. Pour hot water into roasting pan to go about half way up outside of soufflé dish. Place on bottom rack in oven and cook until middle is set, about 1½ to 2 hours. Remove from oven and let cool on counter in water bath. When cool, cover with plastic wrap and chill overnight. Unmold by running butter knife around edge and placing dinner plate over top of dish. Invert and remove soufflé dish. Caramel coating will be runny. Sprinkle top with optional shredded coconut and serve. Wow, I hadn’t realized you had responded to my comment until just now (I’m still figuring wordpress out). Thanks SO much for the recipe. I’ll try it soon, it seems like a great spring dish! Sara in Salt Lake City.